Just a fortnight back the Special Task Force (STF) of Uttar Pradesh had declared that this young lad arrested from Kolkata was a hard-core militant, dreaded Harkat-ul-Jihad-e-Islami activist and was responsible for serial bomb blasts in the courts of Uttar Pradesh. Now the police has accepted that he was not the person involved in any crime. ADG Brij Lal* says that 'yes he is innocent'. The let him go and and the police calls it a case of mistaken identity now. His family members had all the while kept insisting that the police were falsely implicating him but the joint team of UP Police and West Bengal CID had no hesitation in terming him as mastermind of the bomb blasts and supplier of explosives. The top cops of UP termed him a terrorist. 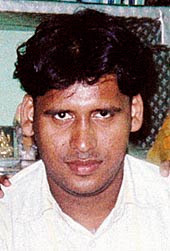 Newspapers declared him a dreaded militant, not a suspected one, even before the case went to court. For 17 days he was kept in detention, beaten up, allegedly subjected to all sorts of torture. His mother came to Lucknow and begged the police and administration to have mercy on him. See this Times of India report about Aftab Alam Ansari being the key HuJI operative and a prized catch. The police and media share equal blame for this. The cops declare that he is a terrorist and the journos don't call it a claim or question it, but repeat the same throwing all journalistic caution out of the window. From Khwaja Yunus to Aftab Alam, the story is same. Muslim youths are picked up at random in similar fashion. The police have to show their efficiency after terror attacks and to ease the pressure on them, dozens of youths, mostly poor are rounded up, kept in illegal detention and made to confess. Not all are as lucky as Aftab, who at least got released. Read the whole story in The Telegraph, that how the police blundered and the court set him free. The goof-up has been accepted. The police had paraded him in press conference, given him several aliases and presented him as an anti-national. The fact that UP has a BSP government and the State is not ruled by BJP (or Congress government in Maharashtra), has also made a difference. And Lucknow is certainly not Ahmedabad. But, the police are the same everywhere. But will the trauma he underwent go away. The youth's fater died long ago. He works in the electricity department in WB and his mother had brought all proofs and identity cards to Lucknow to stress that her son had no other identity. There was anger in Muslims in Lucknow over the arrest. Lately UP police have been conducting similar arrests (a la Maharashtra police) and encounters quite regularly. In such encounters all the criminals are always dead and AK 47 are recovered from them (which they never get chance to use against police during encounter). The public is not fool and understand the cooked story. The Union government must take cognizance. Rogue cops are plenty in our policing system. There are demands of action on the guilty cops from various quarters. But what about dozens languishing in lockups without trial. I don't know if anybody will drag these cops to the court. I doubt his family will have means to stay in Lucknow and fight the case. They will surely rush back to Kolkata. NGOs and social rganisations must take up this issue. At least, he should be paid damages for his character assassination. There is another important issue. Why should police go to any extent to find a scapegoat, who is usually poor, to save its skin after any major crime or terrorist strike. One wrong arrest does far greater damage to the society and the reputation of police than a dozen right catches.